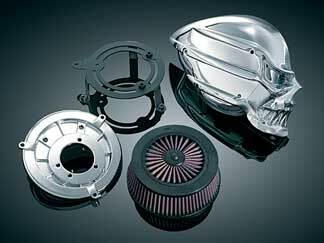 Not for the faint of heart, our new Skull Air Cleaner kits are a vile and sinister addition to any ride. The outer cover is a high-strength, extremely rigid composite material, chrome plated for killer good looks. These kits are complete with a K&N high-flow filter element as well as any necessary brackets and hardware required for a quick and easy installation. Carburetor re-jetting is required and the necessary jets are included for your convenience. Note: These kits contain an all-chrome Skull Air Cleaner, mounting kit and carburetor jetting necessary for a complete, sanitary installation. For optimum performance and driveability on fuel injected motorcycles, we strongly recommend use of the Wild Things Fuel Injection Controller (P/N 9218). Ask Your Motorcycle Question Now!